The leaked e-mails show that some researchers use tactics that are every bit as ruthless as those employed by critics outside the scientific community. Under attack from global-warming skeptics, the climatologists took to the barricades. Indeed, the criticism only seemed to increase the scientists' resolve. And worried that any uncertainties in their findings might be pounced upon, the scientists desperately tried to conceal such uncertainties. "Don't leave anything for the skeptics to cling on to," wrote renowned British climatologist Phil Jones of the University of East Anglia (UEA) in a leaked e-mail dated Oct. 4, 2000. Jones, who heads UEA's Climate Research Unit (CRU), is at the heart of the e-mail scandal. But there have always been plenty of studies that critics could quote because the research findings continue to be ambiguous. At times scientists have been warned by their own colleagues that they may be playing into the enemy's hands. Kevin Trenberth from the National Center for Atmospheric Research in the US, for example, came under enormous pressure from oil-producing nations while he was drawing up the IPCC's second report in 1995. In January 2001, he wrote an e-mail to his colleague John Christy at the University of Alabama complaining that representatives from Saudi Arabia had quoted from one of Christy's studies during the negotiations over the third IPCC climate report. "We are under no gag rule to keep our thoughts to ourselves," Christy replied. Paleoclimatologist Michael Mann from Pennsylvania State University also tried to rein in his colleagues. In an e-mail dated Sept. 17, 1998, he urged them to form a "united front" in order to be able to develop "effective long-term strategies." Paleoclimatologists try to reconstruct the climate of the past. Their primary source of data is found in old tree trunks whose annual rings give clues about the weather in years gone by. No one knows better than the researchers themselves that tree data can be very unreliable, and an exchange of e-mails shows that they discussed the problems at length. Even so, meaningful climate reconstructions can be made if the data are analyzed carefully. The only problem is that you get different climate change graphs depending on which data you use. Mann and his colleagues were pioneers in this field. 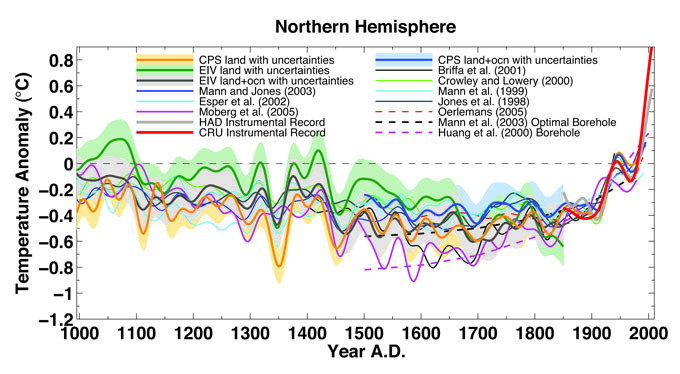 They were the first to draw up a graph of average temperatures in the Northern Hemisphere over the past 1,000 years. That is indisputably an impressive achievement. Because of its shape, his diagram was dubbed the "hockey stick graph." According to this, the climate changed little for about 850 years, then temperatures rose dramatically (the blade of the stick). However, a few years later, it turned out that the graph was not as accurate as first assumed. In 1999, CRU chief Phil Jones and fellow British researcher Keith Briffa drew up a second climate graph. Perhaps not surprisingly, this led to a row between the two groups about which graph should be published in the summary for politicians at the front of the IPCC report. The hockey stick graph was appealing on account of its convincing shape. After all, the unique temperature rise of the last 150 years appeared to provide clear proof of man's influence on our climate. But Briffa cautioned about overestimating the significance of the hockey stick. In an e-mail to his colleagues in September 1999, Briffa said that Mann's graph "should not be taken as read," even though it presented "a nice tidy story." In contrast to Mann et al's hockey stick, Briffa's graph contained a warm period in the High Middle Ages. "I believe that the recent warmth was probably matched about 1,000 years ago," he wrote. Fortunately for the researchers, the hefty dispute that followed was quickly defused when they realized they were better served by joining forces against a common opponent. Climate-change skeptics use Briffa's graph to cast doubt over the assertion that man's activities have affected our climate. They claim that if our atmosphere is as warm now as it was in the Middle Ages -- when there was no man-made pollution -- carbon dioxide emissions can't possibly be responsible for the rise in temperatures. "I don't think that doubt is scientifically justified, and I'd hate to be the one to have to give it fodder," Mann wrote to his colleagues. The tactic proved a successful one. Mann's hockey stick graph ended up at the front of the UN climate report of 2001. In fact it became the report's defining element. In order to get unambiguous graphs, the researchers had to tweak their data slightly. In probably the most infamous of the Climategate e-mails, Phil Jones wrote that he had used Mann's "trick" to "hide the decline" in temperatures. Following the leaking of the e-mails, the expression "hide the decline" was turned into a song about the alleged scandal and seized upon by Republican politicians in the US, who quoted it endlessly in an attempt to discredit the climate experts. But what appeared at first glance to be fraud was actually merely a face-saving fudge: Tree-ring data indicates no global warming since the mid-20th century, and therefore contradicts the temperature measurements. The apparently erroneous tree data was thus corrected by the so-called "trick" with the temperature graphs. The row grew more and more bitter as the years passed, as the leaked e-mails between researchers shows. Since the late 1990s, several climate-change skeptics have repeatedly asked Jones and Mann for their tree-ring data and calculation models, citing the legal right to access scientific data. In 2003, mineralogist Stephen McIntyre and economist Ross McKitrick published a paper that highlighted systematic errors in the statistics underlying the hockey stick graph. However Michael Mann rejected the paper, which he saw as part of a "highly orchestrated, heavily funded corporate attack campaign," as he wrote in September 2009. More and more, Mann and his colleagues refused to hand out their data to "the contrarians," as skeptical researchers were referred to in a number of e-mails. On Feb. 2, 2005, Jones went so far as to write, "I think I'll delete the file rather than send it to anyone." Today, Mann defends himself by saying his university has looked into the e-mails and decided that he had not suppressed data at any time. However, an inquiry conducted by the British parliament came to a very different conclusion. "The leaked e-mails appear to show a culture of non-disclosure at CRU and instances where information may have been deleted to avoid disclosure," the House of Commons' Science and Technology Committee announced in its findings on March 31. Sociologist Peter Weingart believes that the damage could be irreparable. "A loss of credibility is the biggest risk inherent in scientific communication," he said, adding that trust can only be regained through complete transparency.